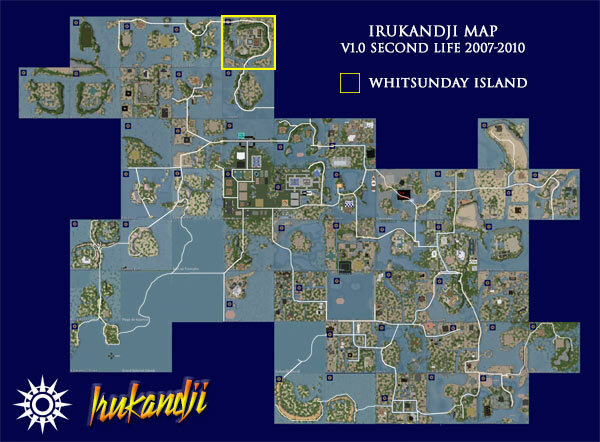 Whitsunday Island was a residential sim in northern Irukandji. Part of Jillaroo State, its terrain was based on the popular template I created for Upper Aboyo Passage a year earlier. During its life, Whitsunday Island enjoyed 100% occupancy, with a Mexican landholder of long standing renting the entire island for himself and his extended family. He created a large palatial estate there which was very impressive. The Trans Irukandji Causeway followed the crescent shaped hills that encircled the estate, connecting Whitsunday Island with the neighbouring regions, Captain Cook Reef and Coolangatta. Only one other region adjoined Whitsunday Island, which was Tanawayo Bay, only accessible by sea. Disappointingly, no photographs survive of Whitsunday Island. If you visited there and have photos to share, please let me know in the comment section below.